I am new to Tinderbox, trying to do something which should be basic. i developed a prototype. Made the prototype Journal. In actions typed. But to no avail do I get the date added for new notes that I add to prototype container. i do get the new note as "Journal" tab. I even tried putting in Display Expression, format($Date,"l")+": "+$Name), from the Get info box but I get an error no $Name. To stop the display expression running in the prototype itself, select the prototype and open the Text Inspector, Title tab. Un-tick the bottom tick-box 'Display Expression Enabled'. Now the display expression is only run in notes using the prototype. On my (UK locale) Mac, a note called "Test Entry" with a $Date of today (26 July 2015) has a $DisplayName of "26/07/2015: Test Entry". On a US system is will likely appear as "07/26/2015: Test Entry". I hope that's what you wanted. If I've misunderstood, please re-state the question. 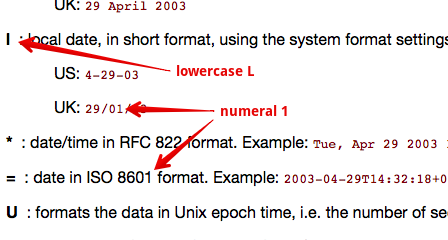 Further to discussion later in this thread: the date formats originally used here are correct but the 'code' font used by the forum uses the same glyph character for numeral 1 and lowercase L. The code .format("l") is a lowercase letter L and not the numeral one. I will take your advice about starting a new thread for others. Thank you for your response. I am trying to place individual note in a container called "Journal"
When I open those notes in the "Journal" Prototype I want the heading of the note to have the name of the individual note but the date and time of the note when it was created. Also I want the note to automatically tab to the "Journal". Now this is what i did. 1. I want the container note "Journal" to set a prototype (also called "Journal"). 2. I want notes using this prototype to show a display expression of the creation date and title of the note. #1. TB will let you make more than one note of the same name but I'd strongly advise a non-export user not to do this to avoid edge-case problems they will lack the experience to fix. So, either rename your journal container or the prototype. If you rename, the prototype don't forget to change the prototype name you use on your action code. When you code in the Action tab for a non-agent note you are setting the $OnAdd, therefore you want to set this for the Container *not* the note you will put in the container. When you put a note into a container that fires the $OnAdd of the container. Almost ready to Yell Uncle, I now have the note to follow the format Date plus name of note when it goes into p_Journal. A big But!! However, I get Never:Name of note. Never has been substituted for a date. Where did I go wrong. Got it to work, thank you, Change the ("1") to the letter ("l"). 1 to the small letter L.
I've always felt lowercase L was a bad choice for the reason arising here. In many typefaces there is little - sometimes no - difference between l and 1. Anyway, I've edited the aTbRef date format page with extra text to clarify the l-vs-1 issue. I've also edited any of my posts upthread which were using code copied/pasted from your original post. I'd close by saying my comments in this post aren't meant rudely. You've flagged up an easily made error that's worth illuminating for other readers of this thread. edit: I checked and I did use the correct character for the date format (at least my memory is not going!). The problem is the 'typewriter' markup used to indicate code sections uses a very similar glyph for l and 1 (e.g. ( l 1). The data format "l" stands for "local" or "locale".